Need help with your crowdfunding pitch? These are for YOU! 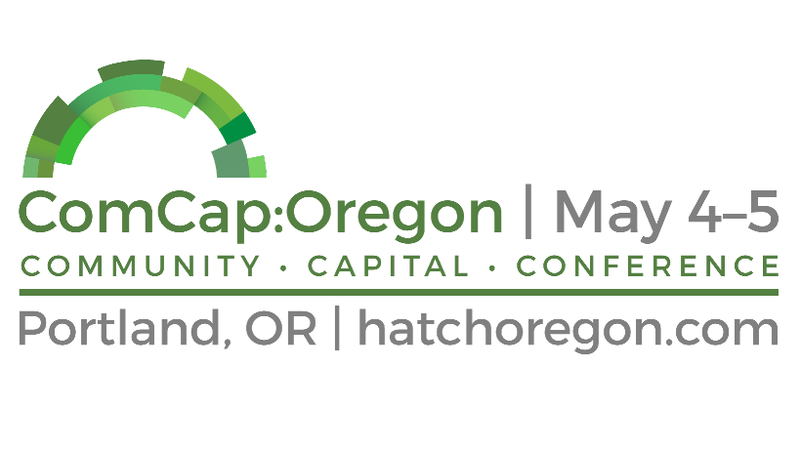 On May 4th and 5th, Hatch Oregon brings together experts from across the state and beyond, convening for the first statewide conference on raising community capital through Oregon’s new crowdfunding law at ComCap:Oregon. During Tuesday’s daylong summit, expert panels, presentations, and workshops focus on the three key constituencies who are the main ingredients in creating a successful road map to strengthen Oregon’s economy: Ecosystem Builders, Entrepreneurs, and Citizen Investors. All of these unique sessions are customized to share knowledge of what’s working, and to address the gaps in Oregon’s ecosystem for local investing. Two sessions that Entrepreneurs should be particularly excited for are Tell Me About Your Business and Cultivating Your Crowd. First up, you’ll learn how to make your business values and community benefits strikingly clear to who matters: your investors and audience. Join this pitch clinic to learn about making your business value and community benefit clear. Next up, there’s Cultivating Your Crowd, a must-go for anyone interested in gaining a new look at insightful, strategic marketing and really communicating with your audience. Chad Carter is a former TV journalist with over a decade spent in front of the camera. Through a career of listening, interviewing, and sharing stories, Chad developed the unique ability to find the story within others. Working with small businesses, executives, and leadership teams, Chad helps to identify, develop, and share the message that best represents your brand. Stephanie Fleming is the Founder and President of Viri Group. Viri provides market strategy and planning services to mission-based enterprises. Stephanie is a seasoned marketing executive with over 20 years in brand and market management, strategic planning and operations. She also has extensive experience building consensus and facilitating co-created solutions among company partners, cross-functional teams, and stakeholders. Her experience includes executive and senior marketing positions with both start-ups and Fortune 500 companies such as: Time Warner, National Geographic Channel, Verizon, and Black & Decker. Stephanie holds an MBA in Marketing and Finance from the University of Maryland, and a BA in Political Science and Russian Studies from Hollins University. She resides in Portland, Oregon, where she enjoys hiking the mossy Northwest forests, participating in the growing social innovation movement and raising backyard chickens. Upon graduating from Arizona State University with a degree in Wildlife Conservation Biology, Mitch ventured into entrepreneurship for the first by co-founding the outdoor adventure company: Arizona Outback Adventures. This endeavor entered a crowded marketplace and after 3 years was the leading hiking and mountain biking tour company in the state. After Arizona Outback Adventures, he went on to co-found Morange Design. Morange Design focuses on strategy, design and UX, social media & content and technology integration. On a personal note, Mitch is a passionate advocate for entrepreneurs and currently serves as the Board Chair of the Oregon Entrepreneurs Network. He self-admittedly loves to connect the ideas and dots between entrepreneurs, support organizations, universities and diverse industry verticals, and always up to brainstorm those ideas over a coffee or adult beverage. Bruce Melzer is a business advisor and award-winning journalist. With his strong background in sustainability, he’s held management roles with start-up and established energy efficiency companies. He ran business development for the team that brought NPR into the era of mobile, apps and social media. As a radio, print and web journalist he’s covered business from Indonesia to Alaska, for the likes of Marketplace, NPR, ABCNews.com and the Anchorage Daily News. Bruce has a BS from UC Davis and an MBA and MS in Journalism, both from Columbia University. Rosetta Shaw is program manager at Sustainable Valley Technology Group, an incubator/accelerator in Southern Oregon. She is a native Oregonian and a passionate advocate for the importance of local investment, community support, and entrepreneurship. Sustainable Valley Technology Group is an independent, non-profit, economic development initiative founded to create a more prosperous and sustainable economy. Founded in July 2010, Sustainable Valley is the only business accelerator in the six counties of Southern Oregon to support the growth of innovative, start-up companies.Rosetta earned a Master in Business Administration from SOU School of Business and holds a certificate international business. She earned an undergraduate degree from Southern Oregon University in both Business Management and French Language and Culture.